Car seats are a necessity with children. Though some parents scoff at the added expense, there really is no price to put on the safety of our children’s lives. We’d feel awfully bad if we were in an accident and our child was hurt due to a preventable scenario in buying a properly fitted car seat. 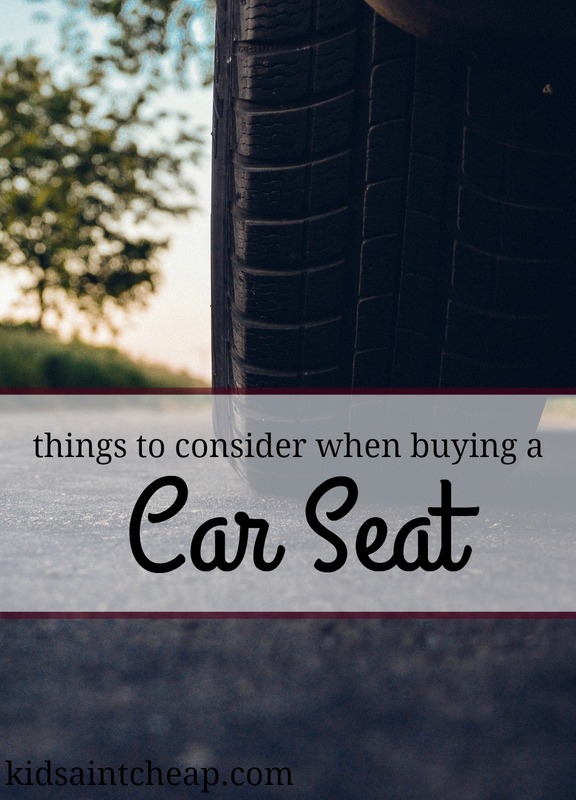 In saying all this, it can be overwhelming when it comes to actually choosing a car seat for your child. It’s been a few years since we’re had to shop around for a car seat but now that we’re in the process of buying a second vehicle we’re faced with the added expense of another car seat as well (because any parent knows how fun it can be to play musical car seats between multiple vehicles!). There are a lot of great resources out there on child car seat safety, helping to direct you in terms of exactly what specifications you need for your child, but I will also offer a few things to consider from a mom perspective. Like any important purchase, research will be necessary before buying anything. There are many resources out there to help you read up on the safety and/or known issues with the car seats you have selected. Also don’t forget to research car seats that fit will in your current vehicle. We researched car seats forever and finally settled on one only to receive it and find out it didn’t fit in our vehicle at all. The base was way too large so we had to return it and start our search over. Had we started with searching forums about seats that fit well in our vehicle it would have greatly narrowed our search down and saved us a ton of time. Car seats actually expire. There are a number of reasons manufactures choose to do this (and it really isn’t just a money grab), things like plastic breaking down and safety labels falling off are a few. When we bought out first infant car seat we got a great sale for a car seat/stroller combo only to find out the car seat would actually expire before we were done using it. Thankfully the store had another (with a longer expiration date) in store and exchanged it for us allowing us to use it for the almost full 18 months we intended. At most major retailers (think Walmart or Babies ‘R Us), you can find car seat savers. They are essentially a pad you put in your car and can sit your car seat on. We didn’t buy one and regretted it. The car seat can make your vehicle kind of…gross. While nothing much happens during the newborn infant stage, the car seat (or base depending on model) can seriously indent the seat of your vehicle. Once kids are old enough to have snacks and drinks in the car it becomes a whole new world. 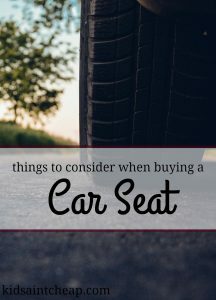 You will find things under the car seat you didn’t know existed (food, water stains, toys…) having one of these seat savers will help you preserve your car. Bonus, they’re pretty cheap, I see them in sale for less than $20 quite often. A car seat is an important purchase for your family and there is a lot to consider when buying one. What was the biggest influence on you when deciding on what to buy?